Floating boom barriers are designed to exclude or contain floatable objects in marine environments. 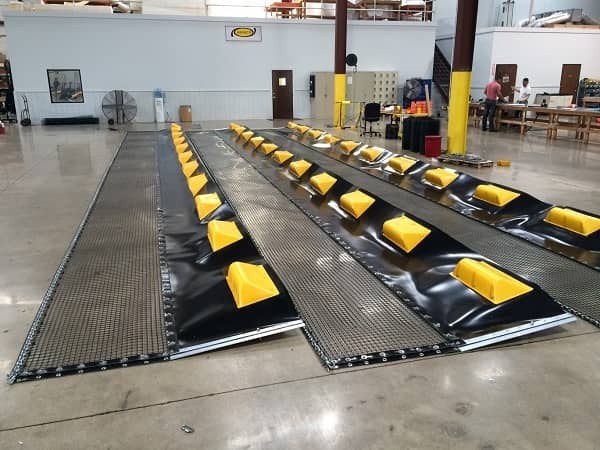 Since these floating boom barriers are designed to limit the spread of sargassum, trash, plastic, and debris, these barriers can either be used for containment, deflection or secure a perimeter area. ABASCO has designed special aquatic plant barriers to prevent the migration of sargassum and aquatic plants onto shorelines or tourist beaches. The design allows for water movement but curtain mesh prevents the impact of sargassum and aquatic plants invasion along the shoreline or beaches. A properly installed ABASCO Aquatic Plant Barrier should deflect the vegetation where installed offering long term or seasonal protection from build up where a properly anchored perimeter is established. Below are our standard products developed for the many different applications required to protect coast line and beaches. These Aquatic Barriers are designed to contain, deflect or block various forms of Debris (Trash and/or Organic Material) while still allowing Aquatic Life to freely pass underneath the barrier. The Barriers are Animal friendly, they do not have netting or other materials that can potentially trap Animals causing serious injury and/or death to the Aquatic Life or cause damage to the surrounding Environment. Overall Height 15" 30" 45" 60" 75"
Freeboard 4" 7" 9" 12" 15"
Draft 11" 23" 36" 48" 60"
Description Designed for light floating debris in calm environments, such as floating leaves and plastic bottles. Designed for floating debris such as seaweed and common plastic or paper trash. Capable of handling light buildups in relatively calm environments. Designed for larger debris such as sargassum and small tree limbs in a relatively calm environment. Designed for heavier buildups of floating debris in more active environments with higher loads from wind, current and wave activity. Designed for floating debris in high demand situations that experience high stress loads from environmental conditions. 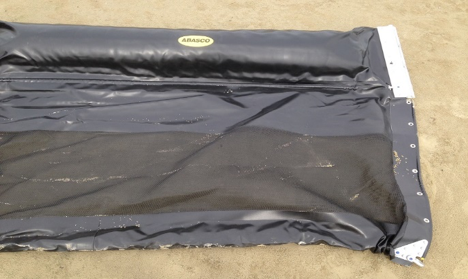 ABASCO has created a floating debris boom by modifying the robust permanent boom to include a bolt on composite screen or monofilament fabric to allow water flow underneath while the fabric prevents debris, sargassum/seaweed or sediments migrating through the barrier. Applications can be customized for industrial, shoreline or storm water applications. This product can also be used as a trash boom. Please contact us for additional information. These Debris Barriers are designed to contain, deflect or block various forms of floating Debris in permanent installations. The type of Debris includes trash, tree limbs, small logs & seaweed buildups. The Barriers include a solid belting top portion with HDPE floats & geogrid netting with a Chain Ballast. Overall Height 36" 54" 48" 60" 72"
Freeboard 10" 10" 10" 10" 10"
Draft 26" 44" 38" 50" 62"
Description The 18" Belting is used in lighter applications or for faster moving water. The 18" Geogrid Netting primarily works for light collections of top floating debris. The 18" Belting is used in lighter applications or for faster moving water. The 36" Geogrid Netting allows for deeper debris or light debris buildups at the barrier. The SB-24/24 is similar in size to the SB18/36 but will have increased tensile strength and a deeper drat the remains solid/impermeable which helps with small floating fragments (leaves, wood chips, etc..) or oil in the water. The 24" Belting is used in heavier applications where the additional tensile strength and deeper belting under the surface might be required. The 36" Geogrid allows for a draft of 4' which is ideal when dealing with heavy Sargassum buildups. The 24" Belting is used in heavier applications where the additional tensile strength and deeper belting under the surface might be required. The 48" Geogrid allows for over 5' of draft to work on the largest debris buildups. ABASCO offers floating debris barriers and trash booms which utilize various mesh sizes of nets secured to flotation which protect water intakes and other areas from debris. These can be used for industrial, shoreline or storm water applications and customized for the applications. Floating debris barriers utilize nets of various mesh size to protect intakes and other areas from debris and marine animals, including turtles. Please contact us for additional information. All site contents copyright 2005-2019.